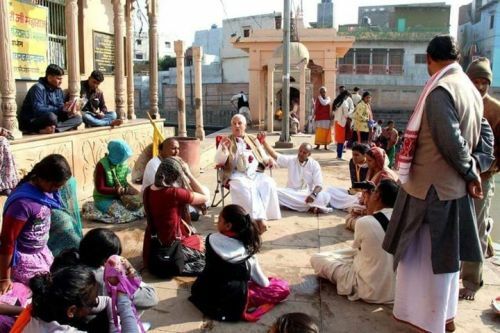 “How true,” I thought, “but who are those devotees who have been making these sweets daily for the past thirty years at the temple?” I was now convinced that they couldn’t be any less than saints. When I came to know who one of those devotees is, I wasn’t surprised. For more than twenty-five years I had observed his calm and unassuming nature, and his steady service to the Deities and devotees. Swayambhu Das, a behind-the-scenes person, is always welcoming others with a smile and generous gifts of Mangal sweets. I needed to find out what was behind his mood of unconditional service, humility, and patience. Patience—something I realize more and more that I have none of. Patience is a hard discipline. It is not just waiting until something, which we have no control over, happens: the arrival of a late bus, the end of the rain, the return of a friend, the resolution of a conflict. Patience is not waiting passively until someone else does something. Patience asks us to live the moment to the fullest, to be completely present, to taste the here and now, to be where we are. When we are impatient, we try to get away from where we are. We behave as if the real thing will happen tomorrow, later, and somewhere else. We forget that the treasure we look for is hidden in the ground on which we stand. Swayambhu clearly understands this principle; he feels that his moments in Krishna’s service are most precious. 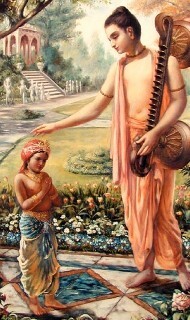 His patience comes from knowing that Krishna will be pleased. It comes from seeing Krishna’s service as a rare gift, one to relish and appreciate. After all, in the spiritual world only Lord Krishna’s most intimate devotees are privileged to serve Him in this personal way. “It is not always easy,” Swayambhu acknowledges, “but I am able to persevere by the grace of my spiritual master.” He recognizes that just as his spiritual master has given him this rare opportunity to progress in his spiritual journey, the grace of his spiritual master helps him overcome the internal struggles. The art of cooking Mangal sweets can be compared to the art of living. We start off with plain ingredients, and with time we see the challenges of life (internal and external) boiling over and sometimes almost consuming us. If we enthusiastically persevere through the purifying process, endure with confidence knowing that the Lord is helping us, and patiently use the moment to take shelter of the Lord, the result will be sweet, saturated, condensed devotion. For most of us to develop such devotion and patience can take a long time, but for some, like Yashoda-mayi Devi Dasi, they are inherent qualities. I was shocked to hear that this sixty-seven year-old lady has been steadily making Mangal sweets for the Deities for the last fifteen years. Yashoda-mayi sees her service as a blissful experience, a personal offering to the Lord, and a way to express her devotion. 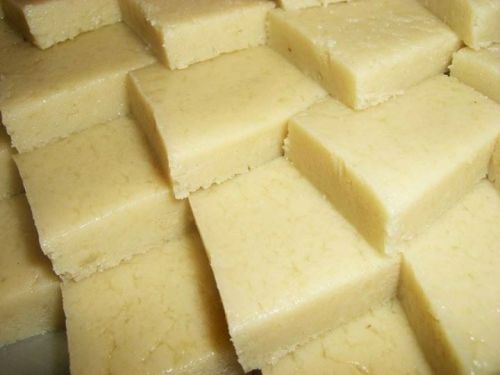 It takes her about five-and-a-half hours, not only to make burfi but also to prepare the other Mangal sweets like sandesh, rasagulla, and sweet rice. She has become expert in making all kinds of authentic Vedic sweets for Sri Sri Radha Radhanath. Her sweet countenance and blissful serving attitude are evidence that these divine virtues emanate from using our lives for Krishna. How difficult it is to be patient by our own efforts? Yashoda-mayi explains that hearing about Krishna and chanting His names before and during the cooking enables her to have the proper consciousness and focus. “The sweets come out differently every time,” she adds, “Krishna is showing us that He is a person, and that He reciprocates with our efforts. So this service can n e v e r b e boring or stagnant. My spiritual master especially presented me with brahman initiation fifteen years ago so that I could make Mangal sweets for the Deities. So I feel inspired to follow his instructions and please him.” Not many devotees are able to do this service, but those who have been part of the Mangal sweet-making crew and those who have recently joined the team, brave the challenges and experience the joys of this service. They cannot be ordinary! If preparing Mangal sweets for the Lord is such a herculean task and is only one of the six food offerings made to the Deities every day, I wonder what it takes to arrange the myriad of other services to the Deities: sewing intricate deity outfits, creating breathtaking flower arrangements and altar decorations, stringing gorgeous flower garlands, dressing the Deities with such creativity and flair, cooking opulent dishes, organizing elaborate festivals, and other aspects of the daily worship of the Lord. It could only come from knowing and experiencing that service to God is the highest and most blissful occupation. The Sri Sri Radha Radhanath Temple, itself, has been built with great sacrifice and patience. It has become the heart of our community, pumping the life of God consciousness into our diseased society, and healing it from the influences of corruption and vice. The temple re-instates the pillars of truth, non-violence, austerity, and cleanliness; and reminds us of the importance of making Krishna a part of our lives, of coming to love Him. UK-The Final Offering. Manor devotees surpassed last year’s number of SP’s books distributed during the Marathon! Sutapa Das: We finished counting the scores yesterday evening. More to come in, but we have to stop somewhere. 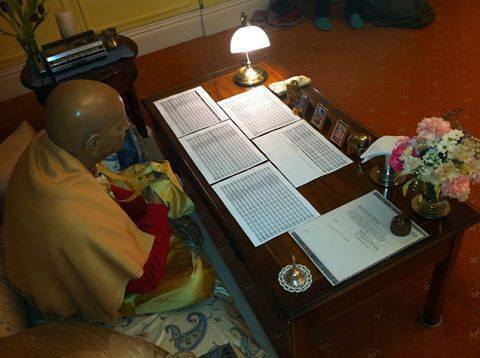 Nikhil prabhu and myself went to Srila Prabhupada’s darshan room to offer him the final results. In that transcendental tirtha, Mahaprabhu’s commander-in-cheif looked effulgent and absorbed, ever exuding the purity and potency which drives this movement forward. 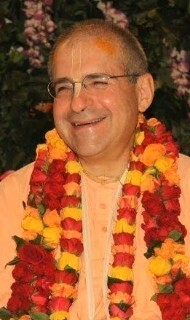 As Prabhupada glanced over each devotee’s name, I prayed for compassion, conviction and creativity. Aside from serving the preaching mission, I thought, what else is worthy of our energies? This is the family business – the best job in the world – and many devotees experienced that in the last month. In this 2016 Marathon, the Manor devotees, as a final offering to Their Lordships and Srila Prabhupada in this 50th anniversary year, distributed… 142,402 transcendental books! We didn’t quite reach 200k, but surpassed last year’s historic marathon by 11000 books, making it another record-breaking effort. Thanks for taking part, giving your heart, and making it a resounding success. All glories to Srila Prabhupada. Q: This is my junior year in high school and like most kids in school, this has been my hardest year. The following question keeps coming back to me. I work hard and I don’t get the results that I want. Do I beat myself up for it and get the results I want for the next time or do I just leave it up to fate? Or for example, do I plan that I want to do certain things so I get into the college of my desire or do I just leave it up to fate or Krishna’s mercy? Because I have noticed that when I don’t pay attention to the results I have no motivation to achieve and work hard. 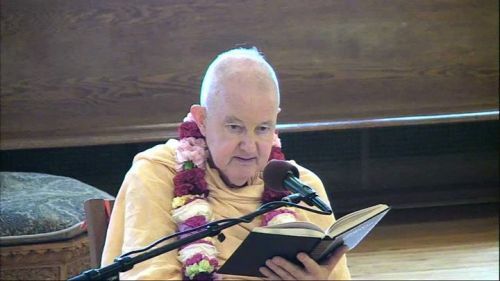 Romapada Swami: Thanks for presenting in such a clear manner this core question, in applying the teachings of Bhagavad-gita to very practical aspects of life like your current academic studies. Please know that this very same application principle arises in every single aspect of our lives, as we mature in age. Best to learn this principle clearly, as early in life as possible. In turn, as the complexities of life unfold before us, the very same principle can be enhanced and developed through application, step by step through the course of our lives. Bhakti teaches us to transfer our attachments from the temporary to the eternal Supreme Person, Krishna via rendering of loving service to please and to satisfy Him. When you bake a cake for your mother or father or a friend on their birthday, will you pay attention to the details of how you mix the ingredients together, such that the cake looks attractive and the taste matches theirs? Will you choose a particular type of cake you know they particularly like — maybe something very different and particularly healthy perhaps? Will your endeavor be focused on getting a result which will be pleasing to and appreciated by them? Endeavor to please Krishna in all that you do in life, including your studies. “Beating yourself up” if the results do not meet your expectations is clearly within the lower modes of nature, and will NOT at all guarantee better grades in your next exam! Nor does Bhakti teach that you must leave things to fate. You have painted for yourself a false dilemma, as a result of leaving devotion to Krishna off the option list. In life, we can always do better, yes? Next, where does ability come from? The source of everything, Krishna, is where ability to do better comes from. Next, how to best encourage Krishna to decorate you with increased ability? Answer: When Krishna sees you are striving for one purpose only, to serve and to please Him, you can expect His mercy to flow, in whatever manner or form He decides. Think of Mother Yasoda binding Krishna. Only when Krishna extended His Kripa-Sakti were Mother Yasoda’s efforts successful in binding Krishna. There are so many scriptural examples that teach us this very same lesson. Bhakti teaches that your Dept is the Service Department, and Krishna’s Dept is the Results Dept. You do your services to your maximum capacity in full Krishna Consciousness, striving all the while to make the best possible offering to Krishna, while simultaneously understanding that the Results are in fact fully up to Krishna. Cultivation of this principle in all that you do is the art of living in Krishna Consciousness. Modern research proves that persons who engage in hobbies that involve the brain, like reading or puzzles, are less likely to fall into the grips of mental and physical disease. What to speak of the benefits we receive by reading Bhagavad Gita everyday? But reading in this world is filled with distractions and isn’t always easy.We might read a few verses or even few pages and get distracted by the notifications on our phone or those news feeds on FB etc. This way we inevitably end up dragging and procrastinating our reading of Bhagavad Gita for hours, days and months. This procrastination leads to a development of distaste in our spiritual lives. Unless we consciously allocate time for reading, we may never read a chapter every day. Therefore the process has been simplified. All you need is 15 minutes a day to read the Sanskrit verses OR the English translations along with just ONE purport. You could do it in the morning, before bed or even during your commute t0 work/school. Whenever it is you choose, make sure you put it in your schedule and strictly adhere to it. Just by reading Bhagavad Gita for 15 minutes everyday, you will perform almost 91.25 hours of topmost worship of Lord Krishna for the entire year of 2017. Nothing in the world can stop you from achieving spiritual success if you sincerely, strictly, and seriously follow this practice. By this form of worship through intelligence, we can please Krishna. When He is pleased we, in turn, become blissful.